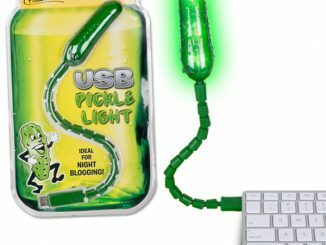 The delicious taste of Pickles can be all over you forever! Bathe that horrid scent of mountain fresh springs off yourself and get all Pickled-up. The scent will make everyone’s nostrils perk up in excitement and send Delis into a wild frenzy. 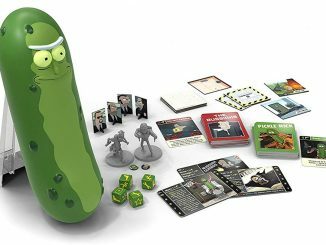 You’ve done it: gotten yourself into quite a Pickle. – Fresh Dill Pickle scent. 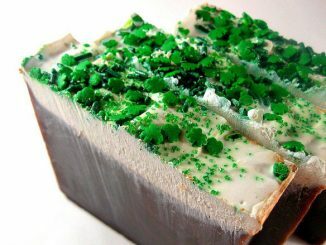 – “Pickle Soap” carved on top. – Net wt. 2.3 oz (65 g). – Tin size: 3-3/4″ x 2-3/8″ x 7/8″ (9.5 cm x 6 cm x 2 cm). 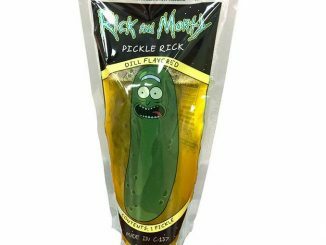 Just when you thought life was good with the invention of pickle-flavored potato chips, your lucky stars are now shining down upon you with the existence of pickle soap. Ever notice how pickles last forever in a jar? 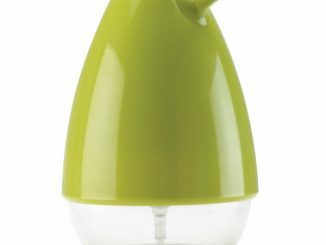 Maybe a little pickle juice is what your skin needs to stay supple and smooth throughout the day. People sometimes bathe in milk, right? Same difference. 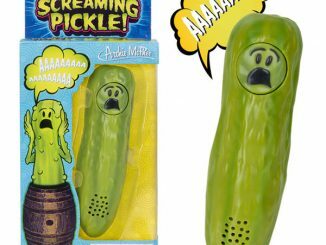 If you’re a pickle hater but someone you know and love is a pickle fiend, pickle soap is a great gag gift to give. 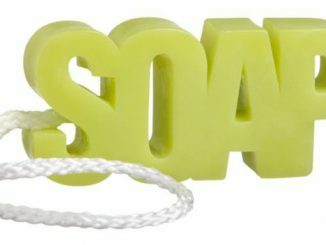 Even after you’ve unwrapped the bar of soap, the words ‘pickle soap’ are still engraved in the bar for show-off purposes. 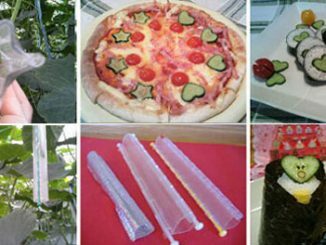 Having a Super Bowl party? 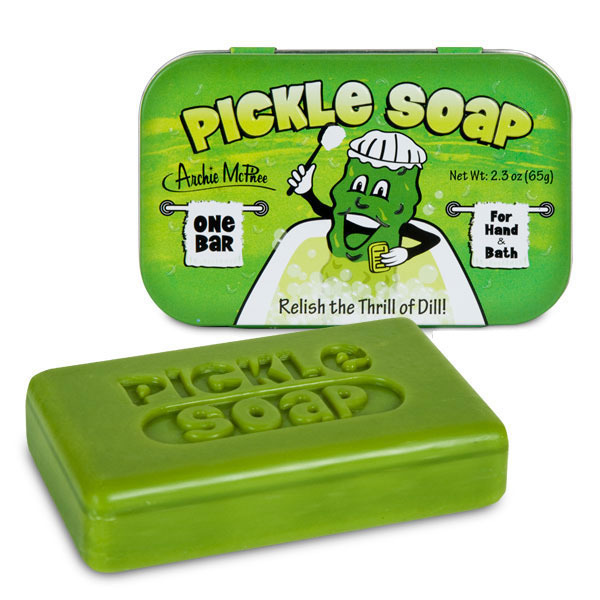 Everyone’s hands are going to smell of chips, pizza, wings and things anyway, so why not let guests wash their hands with a bar of pickle soap? 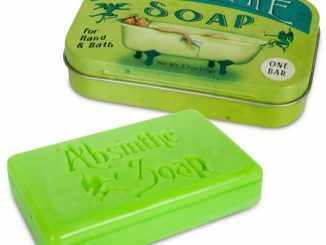 Pickle Soap is sold for $8.49 at Stupid.com. 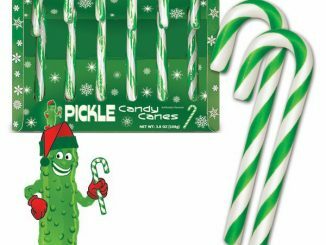 Pickle fans will be pickled pink, or green, to know that there are also Pickle Adhesive Bandages and Pickle Fingers to wear for fun. 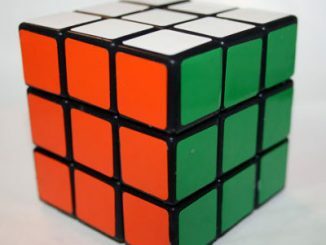 It’s official, this is my new gift for birthdays.